Today is January 3rd. It's birth month! I still cannot believe how quickly time has flown in the last trimester. God is so good. We are just 21 days from the due date. t w e n t y o n e days!!! Maternity clothes? 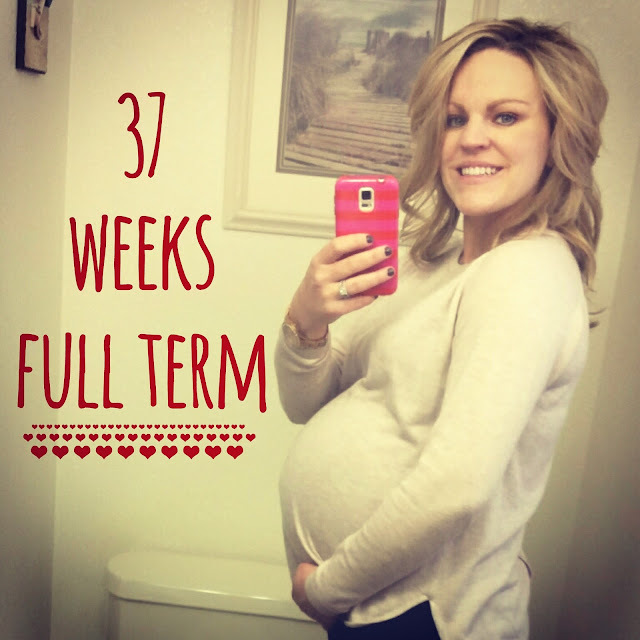 I'm so thankful that I splurged and purchased maternity clothes this pregnancy. They are so much more comfortable than regular clothes with the hair tie trick! Sleep? Finding comfort has been really tough. I wake Travis up in the night with all my tossing and turning. Rolling over requires me to sit completely up in bed and then rotating my body. I could nap every single day. Best moment this week? It's not only birth month but a new year. We have a lot to look forward to this year! New baby, new home, and a lot of new adventures. Movement? I usually have a baby part sticking out somewhere, lots of hiccups, and a lot of movement lower than before. He has defiantly dropped some. Cravings? None. Food doesn't sound good at this point. There is nowhere to put it. I have to remind myself that I have to eat. I've been eating a lot of yogurt. Symptoms? Braxton hicks contractions are growing stronger by the day. I have them everyday. My hips are driving me bonkers. A really heavy belly. Exhaustion. Nothing unusual. Looking forward to? I have a doctors appointment this afternoon. I'm hoping for some progress. I'm so ready to meet our sweet boy. I mean, really ready! Bags have been packed. Let's do this!!! Also, my awesome brother gave me a gift card to get a prenatal massage for Christmas so that is happening on Thursday! I can't wait. Oh, and Travis turns 34 tomorrow!